Marty’s brand new hit collection is out now! 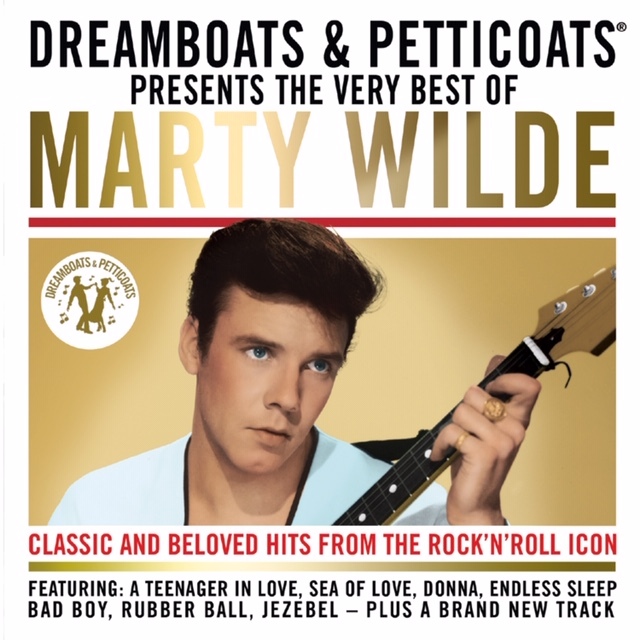 We’re delighted to announce that Marty has partnered with the long-running Dreamboats and Petticoats range – who for over a decade have been celebrating all things rock’n’roll with its album series and musical. The new album is the definitive collection of all of Marty’s greatest hits, including beloved classics such as A TEENAGER IN LOVE, DONNA, SEA OF LOVE, JEZEBEL, ENDLESS SLEEP, BAD BOY, RUBBER BALL and many more. The album also includes a brand new track ‘Eddie’ – Marty’s tribute to his friend and fellow icon, Eddie Cochran. Order your copy now and let’s get Marty back to the top of the charts! Dreamboats and Petticoats is a wonderfully descriptive title. It evokes so many memories for me, and so many others too, who were lucky enough to have lived and experienced some of the greatest teenage years that any young person could have had. we would be hearing next on our radio stations. I am so proud to have played a small part in this Dreamboats & Petticoats album, and I sincerely hope you enjoy it.